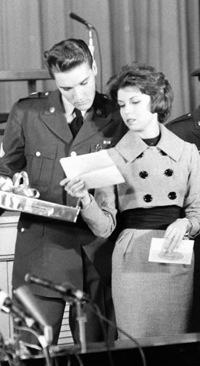 Elvis Presley had been riding an unparalleled two-year high in the entertainment business when he was inducted into the army on March 23, 1958. During the previous two years he had seven #1 records on Billboard’s Top 100 chart. His concert tours across the country had drawn record-breaking crowds. He had appeared on TV’s top rated variety programs and had made four highly successful films. He was clearly the hottest entertainment personality in the world. Suddenly, however, being sent into exile for two years in the army threatened not only his superstar stature but also his entire relevance as an entertainer. More than once Elvis himself expressed concern that his musical style, along with his fans, might fade away during his two years out of the spotlight. There would be no concerts, TV appearances, or movies to maintain Elvis’s popularity. The over-whelming press coverage would fade to a trickle. 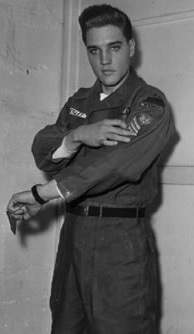 Would Elvis be able to resurrect his career when he returned from the army in March 1960? The answer to that question depended on a thin line of black vinyl. 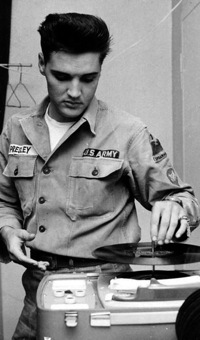 During his military absence, Presley’s sole presence in the entertainment business would consist of records released by RCA, most importantly the periodic release of his 45 rpm singles. If the nation’s radio DJs played them and the public bought them, there was a chance that Elvis could retain some degree of relevance in the music industry while he was away. 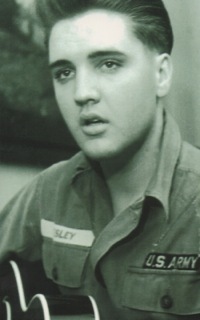 A major concern was that Elvis would not be free to record new songs after he was shipped overseas. RCA was thus forced to rely on a backlog of Presley recordings made in 1958. 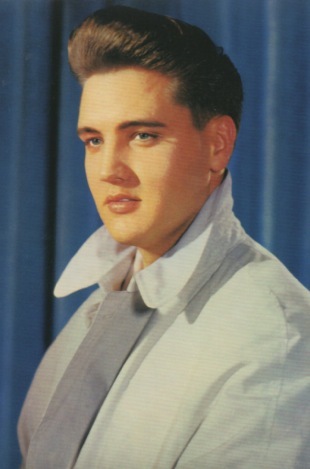 Hopefully pop musical tastes would not shift away from Elvis’s rock ’n’ roll style as the label released his singles periodically over the next two years. 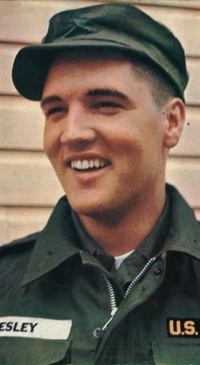 As it turned out, RCA released five Elvis singles during his two-year army stint. And while, as a group they were not as successful as Presley’s previous singles, they did well enough to maintain Elvis’s popularity. That allowed him to resume his career in stride after his discharge. A case can be made, then, that the following five single records were among the most important ones in his career. 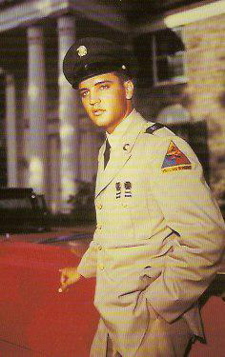 Elvis had only been in the military for a week when RCA shipped his first army single to distributors. On April 9, the “A” side headed Variety’s “Best Bets” list of new single releases. “‘Wear My Ring Around Your Neck’ is in Presley’s familiar swinging groove and he can’t help but stay on top with it,” the magazine predicted. A week later, on April 16, before the platter had even made the charts, Variety reported that it had already sold a million copies. 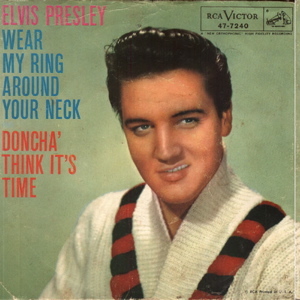 On April 21, 1958, “Wear My Ring Around Your Neck” entered Billboard’s Top 100 at #7, making it the highest debuting chart single in Elvis’s career. On May 19 it peaked at #3, where it stayed for three weeks. It dropped off the chart at the end of July after spending 15 weeks on the Top 100, including 8 weeks in the top 10. The “B” side, “Doncha’ Think It’s Time,” was less successful. It charted just 6 weeks, peaking at #21. 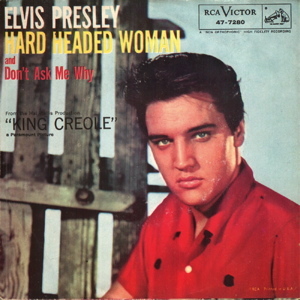 “Hard Headed Woman” entered the Top 100 the last week of June 1958 at #15. The next week it jumped all the way to #3. However, it could get no higher than #2, peaking there on July 21. It was kept out of the top spot by “Yakety Yak” by The Coasters. “Hard Headed Woman” rode the chart for 13 weeks, including 5 weeks in the top 5. The ballad side spent 9 weeks on the chart but peaked barely in the top 30 at #28, that also on July 21. 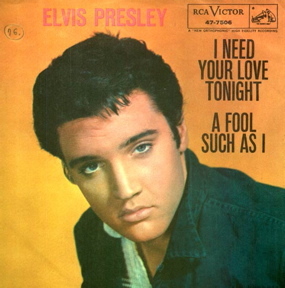 This single release was a double-sided top 10 hit for Elvis in the final months of 1958. “One Night” got as high as #4 on December 15, while “I Got Stung” maxed out at #8 on November 24. 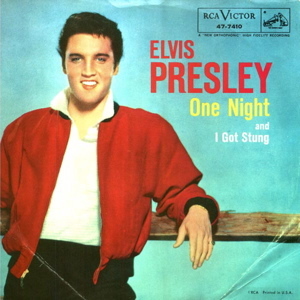 “One Night” remained on the Hot 100 for 17 weeks, the longest chart run among the 10 sides released while Elvis was in the army. “I Got Stung” was just one week behind it’s vinyl mate at 16 weeks on the chart. Elvis first 1959 single release became the second biggest double-sided hit of his career, topped only by “Hound Dog” / “Don’t Be Cruel.” On the Hot 100 for 15 weeks, “A Fool Such As I” settled at #2 on April 27. (The Fleetwoods’ “Come Softly to Me” blocked Elvis from reaching #1.) “I Need Your Love Tonight” did almost as well, charting for 13 weeks while peaking at #4 on April 20. Each side spent 5 weeks in the top 10. 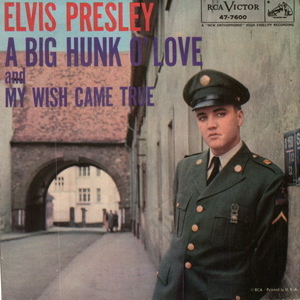 While at least one side of every Elvis single issued during his army stint reached the top 5 on Billboard’s top pop chart, “A Big Hunk O’ Love” was the only one to reach #1. It spent two weeks in the top spot starting on August 10, 1959. “My Wish Came True” charted for a respectable 11 weeks, just missing the top 10 when it crested at #12 on August 17. “A Big Hunk O’ Love” lasted 14 weeks on the Hot 100, but after it fell off the chart on October 12, 1959, Elvis would not have another chart record for six long months. "RCA released five Elvis singles during his two-year army stint. And while, as a group they were not as successful as Presley’s previous singles, they did well enough to maintain Elvis’s popularity."